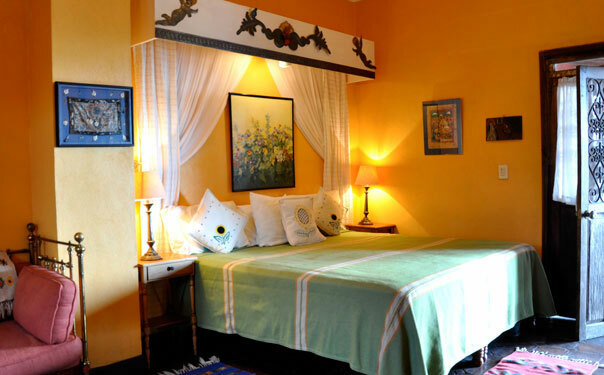 Enjoy the warmth of traditional Mexican colonial architecture, comfortable and quiet bedrooms each with access to outdoor living areas and patios, plus a uniquely personal environment created by Casa de la Cuesta's fine collection of Mexican folk art, crafts and antiques. 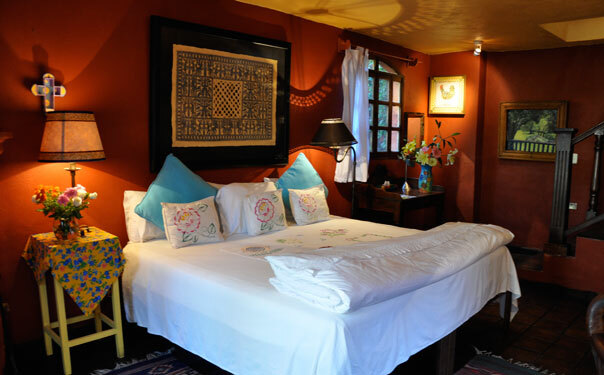 All seven guest rooms, single or double occupancy, are $180 USD, tax and full breakfast included. 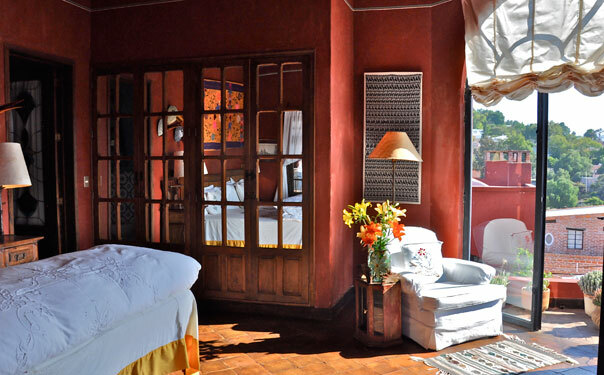 This seven room Bed and Breakfast was constructed to take full advantage of San Miguel de Allende's mild climate so there are many outdoor living spaces and some of the most impressive views of the town and the Guanajuato mountain range beyond. 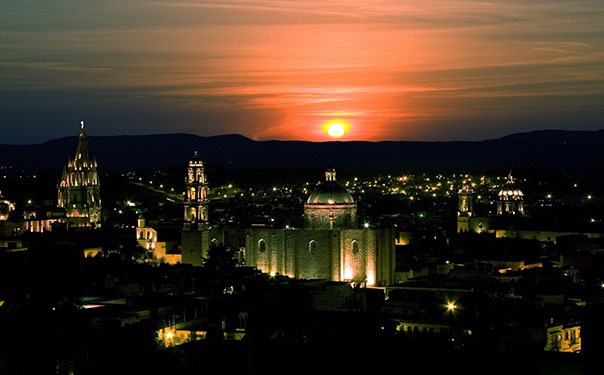 Spectacular sunsets are a specialty at Casa de la Cuesta. 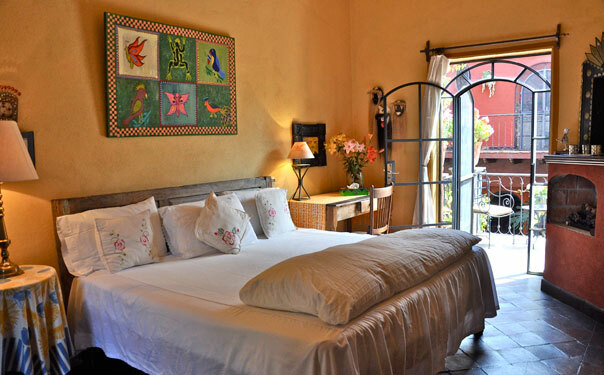 Casa de la Cuesta Bed and Breakfast is located just above the Mercado de Artesanias, the artisans' market, and a short 10 minute walk to the Jardín, the center of San Miguel de Allende's historic district. Click here to see where we are located. Reserve one or more guest rooms and get another room at half price. Minimum three nights. Black out dates apply. 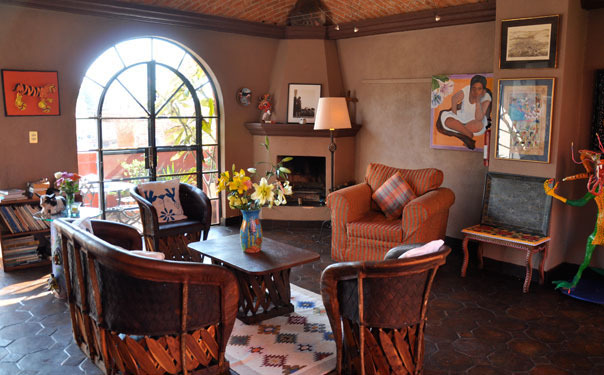 The Colibri room on the upper terrace has the most impressive view of the San Miguel skyline. 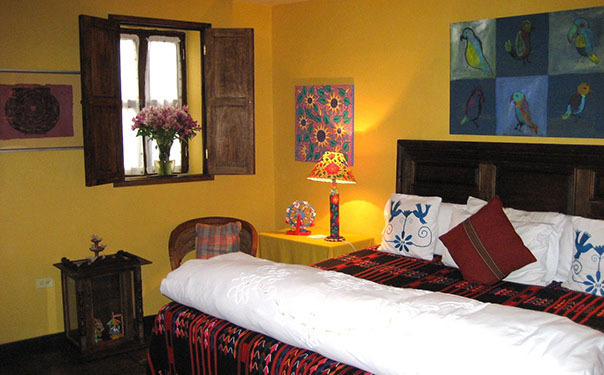 The Roman Lopez room is decorated with naif paintings from the artist Roman Lopez. The Mascaras room is decorated with a variety of authentic folk art and Mexican ceremonial dance masks. 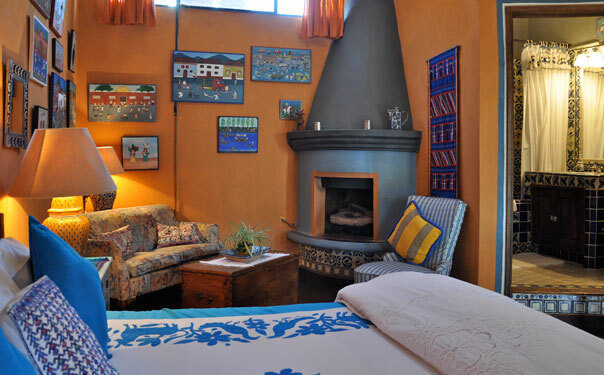 The Escondido room has a fireplace and a private patio as well as a separate dressing room with full bath. The San Miguel Suite features a large living room with fireplace, a kitchenette, a private terrace and a full bathroom. The Garden Casita is adjacent to our botanical garden that contains over 50 different varieties of native cactus and succulents. Copyright © Casa de la Cuesta All rights reserved.